What is ZENESIS™ Pattern Technology? 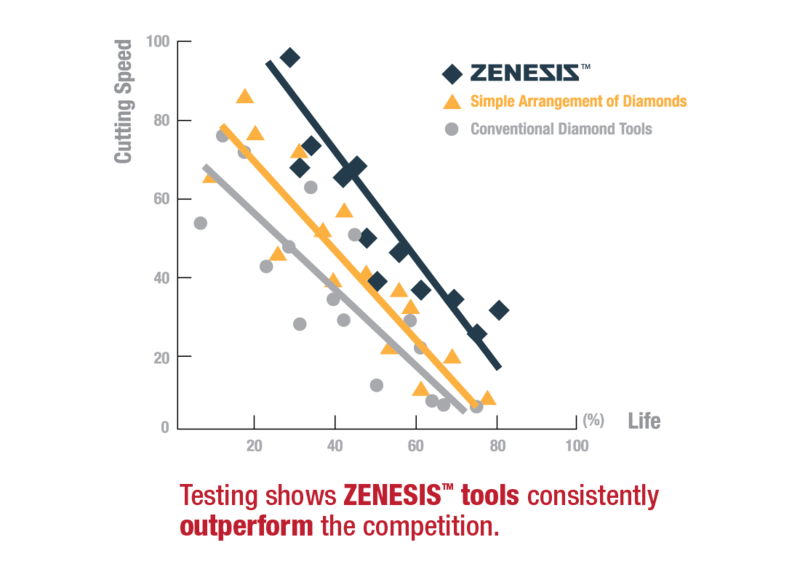 ZENESIS™ is an advanced technology that delivers dramatic improvement in diamond tool performance through the custom designed diamond patterns specific to each application. By combining layering techniques with extraordinary degree of precision, we ensure that our high-quality diamonds will always be evenly exposed throughout the segment to allow faster cutting and efficient debris removal. And we've rigorously exacted our manufacturing processes to ensure a perfect pattern – cut after cut. For our most innovative blade offering, ZENESIS™ takes this process one step further by optimizing the distribution and concentration of diamonds on the segments to deliver raw cutting power where it is needed most – the leading edge. Greater performance is delivered as this strategic concentration of diamonds on the hardest working areas of the segment virtually removes all cutting inefficiencies. Simple patterning is not enough. Patterning technology has been around since 1960's, however the performance gained through even distribution of diamond grit did not justify the added complexity in manufacturing. Through years of intensive research and development, our engineers at ZENESIS™ have refined our proprietary patterned diamond technology to achieve maximum cutting performance without sacrificing life or quality of the cut. Our pattern exposes the ideal number of the highest quality diamonds throughout the life of the tool, providing consistent performance from start to finish. Random distribution results in inconsistent tool performance. Trade-off results between cutting speed and tool life. Elimination of random distribution provides only marginal improvement in performance consistency. 2. Always wear eye protection, safety mask, ear protection and comply with ANSI Z87.1 and all other safety guidelines as per ANSI B7.5 and all OSHA regulations i.e. 29 CFR 1910.94, 1910.95, 1910.133, 1910.215 & 1910.1000 covering handling, storage & inspection –mounting – safety guard – flanges – machine condition – ventilation & air contaminants, eye, ear & other personal protection information. 3. Always mount blade securely in proper rotation direction. Make sure that arbor and flanges are clean, and tighten nut securely. 4. Mount the blade on the correct diameter arbor shaft. 5. Do not use blade on saw machine that will exceed maximum recommended blade RPM. 6. Inspect the blade before each use for excessive wear, core crack, core flatness and arbor damage. Discard damaged or cracked blade. 7. Before performing any cutting operations, let the tool run for a few seconds without load. If blade wobbles, vibrates or unusual noise occurs, stop the tool immediately. Examine the blade for damage or incorrect mounting. 8. The diamond blade is intended for straight line cutting only. Cutting curves will cause stress cracks or fragmentation on the blade, resulting in possible injury to people in the vicinity. 9. Consult your saw operations manual for important safety instructions and warnings. 10. Failure to heed all safety instructions and warnings could result in serious injury. Zenesis is a trademark of EHWA Diamond Inc.
1. No opere la sierra eléctrica a menos que el dispositivo de seguridad de la cuchilla se encuentre en su lugar. 2. Utilice siempre protección para los ojos, máscara de seguridad, protección auditiva y cumpla con las norma ANSI Z87.1 y las demás directrices de seguridad en conformidad con ANSI B7.1, B7.5 y las reglamentaciones de la OSHA 29 CFR 1910.94, 1910.95, 1910.133, 1910.134, 1910.215, y 1910.1000 concernientes a la información sobre seguridad personal, manipulación, almacenamiento y revisión, montaje, dispositivo de seguridad, bridas, acondicionamiento del aparato, ventilación y contaminantes del aire, protección visual y auditiva. 3. Siempre instale la cuchilla de manera segura y en la dirección de rotación correcta. Asegúrese de que el eje giratorio y las bridas estén limpios y las tuercas estén apretadas firmemente. 4. Instale la cuchilla en el diámetro correcto del eje. 5. No utilice una cuchilla que exceda las RPM máximas recomendadas para la cuchilla. 6. Revise la cuchilla antes de utilizarla para ver si hay daños en el eje, desgaste excesivo, fisuras o uniformidad en el eje. Deseche cualquier cuchilla dañada o agrietada. 7. Antes de realizar cualquier operación de corte, permita que la sierra opere libremente durante unos cuantos segundos. Si la cuchilla tambalea, vibra o produce algún ruido anormal, apague la herramienta de inmediato. Revise la cuchilla para ver si tiene algún daño o está instalada de manera incorrecta. 8. La cuchilla de diamante está diseñada para cortes rectos únicamente. Los cortes curvilíneos pueden causar grietas por tensión o ruptura de la cuchilla, lo cual puede resultar en lesiones en personas cercanas. 9. Consulte el manual de instrucciones de la sierra para informarse sobre las pautas de seguridad y algunas advertencias. 10. Existe el riesgo de graves lesiones sino se tiene en cuenta las instrucciones de seguridad. Zenesis es una marca registrada de EHWA Diamond Inc.
1. Ne faites pas fonctionner cette scie si le dispositif de protection de la lame approprié n'est pas en place. 2. Portez toujours des lunettes et un masque de sécurité, ainsi qu'un protecteur d'oreilles, et respectez la norme ANSI Z87.1 et toutes les autres directives relatives à la sécurité conformément à la norme ANSI B7.5 et à tous les règlements de l'OSHA, à savoir 29 CFR 1910.94, 1910.95, 1910.133, 1910.215 & 1910.1000 couvrant les manipulations, l'entreposage et les inspection - le montage - les dispositifs de protection - les brides - l'état des machines - la ventilation et les contaminants dans l'air, et des informations sur la protection des yeux et des oreilles ainsi que d'autres équipements de protection personnelle. 3. Montez toujours solidement la lame dans le sens de rotation correct. Assurez-vous que l'arbre et les brides sont propres, et serrez l'écrou à fond. 4. Montez la lame sur l'arbre du diamètre approprié. 5. N'utilisez pas une lame sur la scie dépassant la vitesse de rotation de lame maximum recommandée. 6. Inspectez la lame avant chaque emploi pour vous assurer qu'elle n'est pas excessivement usée, que le mandrin n'est pas fissuré ou aplati, et que l'arbre n'est pas endommagé. Jetez toute lame endommagée ou fissurée. 7. Avant de réaliser une quelconque opération de coupe, laissez l'outil fonctionner sans contact avec l'ouvrage pendant quelques secondes. Arrêtez immédiatement l'outil si la lame tremble ou vibre, ou si vous entendez des bruits inhabituels. Examinez la lame pour déterminer si elle est endommagée ou si elle a été montée de façon incorrecte. 8. La lame diamantée ne doit être utilisée que pour couper en ligne droite. Les coupes curves entraîneront des fissurations ou des fragmentations de la lame résultant du stress, ce qui risque de causer des blessures aux personnes se trouvant à proximité. 9. Consultez votre manuel d'utilisation de la scie pour y lire des consignes de sécurité et des avertissements importants. 10. Le non-respect de ces consignes de sécurité et de ces avertissements pourrait causer des blessures graves. Zenesis est une marque déposée de EHWA Diamond Inc. The revolutionary ZENESIS™ technology distributes the diamond grit into patterned columns, gradually increasing and focusing the highest concentration at the leading edge of each segment. 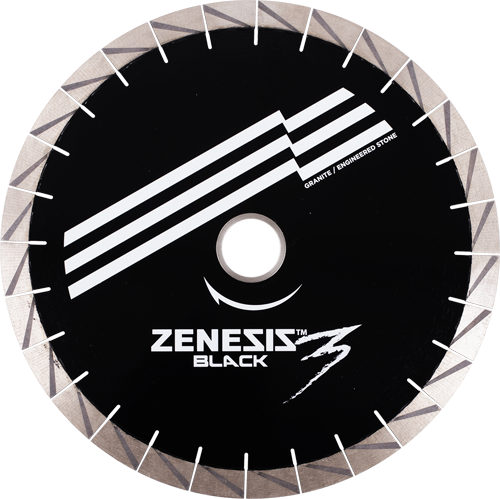 Through uncompromising design, ZENESIS™ BLACK 3 brings industry professionals the fastest, longest-lasting blade in the world. All-new design for reduced chipping and quieter operation. Up to 20% longer blade life*. Cutting granite and engineered stone. Quartzite is a unique natural rock made up of interlocking quartz crystals resulting in a remarkably dense and hard rock. To quickly and cleanly cut a material of this quality requires a specialized blade. The superior quartzite cutting performance of the ZENESIS™ Quartzite blade has been verified through independent testing. 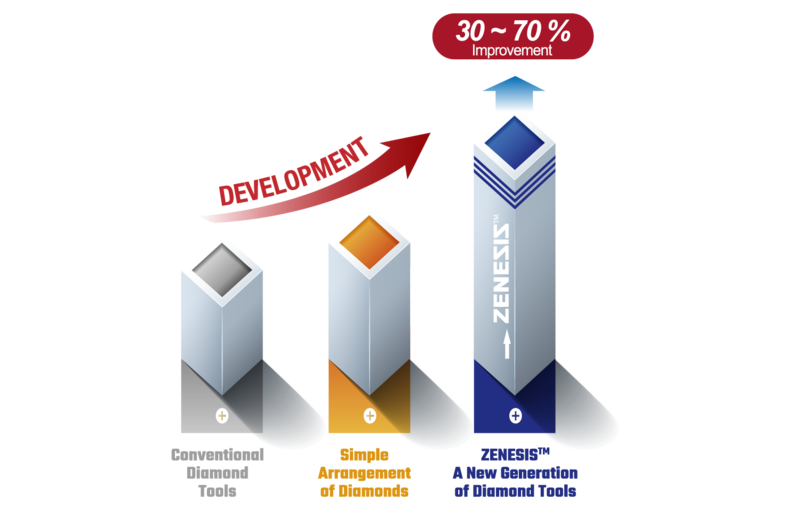 The ZENESIS™ III continues to revolutionize the stone fabricating industry, offering high performance and great value. Building on the renowned success of prior patterned blade generations, the ZENESIS™ III now offers increased cutting speeds, longer blade life, reduced chipping and an even lower noise level – all at a competitive price. 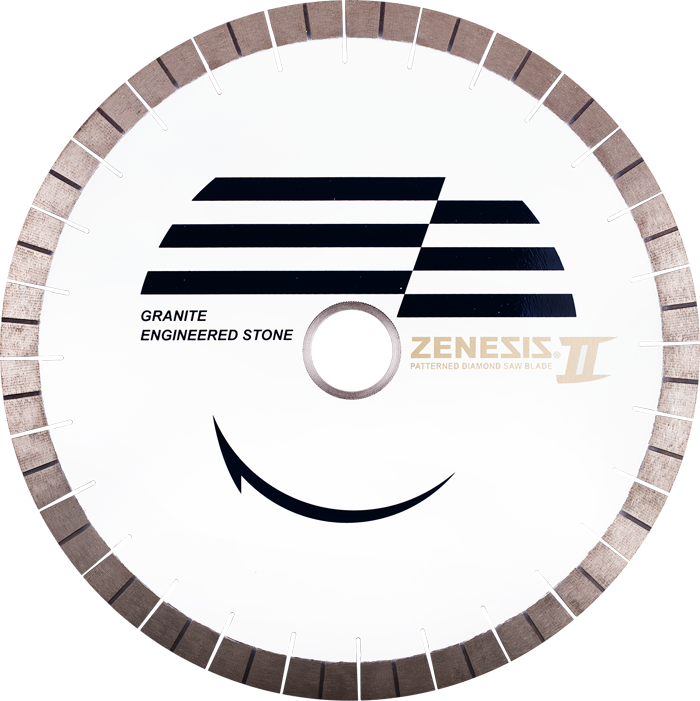 ZENESIS™ offers stone fabricators products that deliver the quietest and cleanest cuts in the industry, and the ZENESIS™ III blade is now the right choice for customers looking for the best value. Feed rate 10 to 17 feet per minute. Miter cuts on granite and engineered stone pose particular challenges and require a specialized blade to get the desired results. 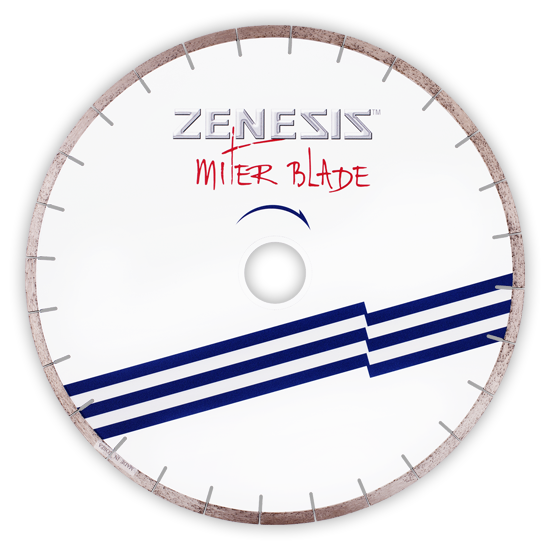 The ZENESIS™ Miter blade provides sharp, smooth and chip free miter cuts. 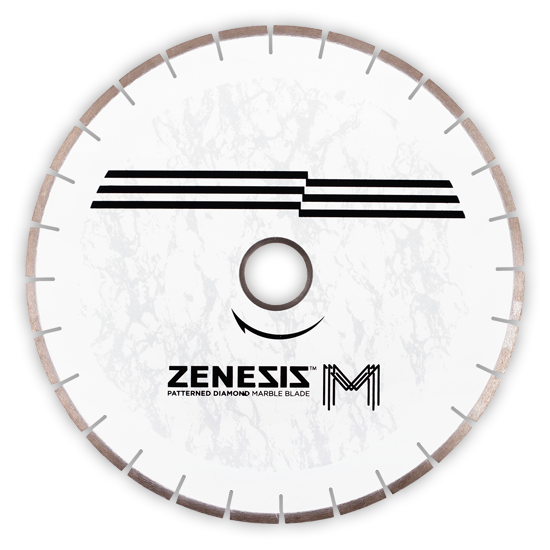 ZENESIS™ now offers its exclusive patterned technology in a bridge saw blade designed specifically to cut marble and other soft stone products. 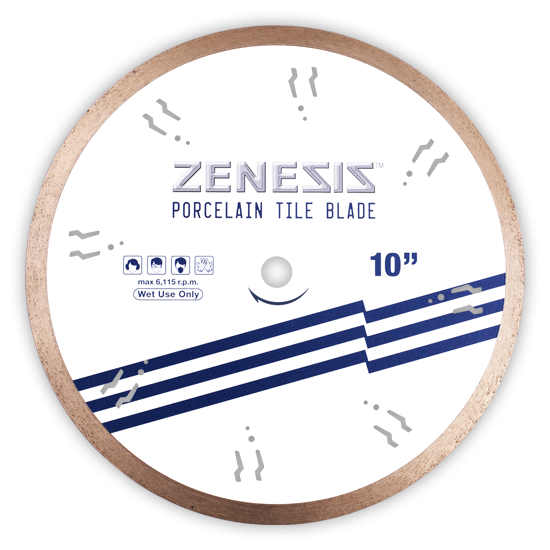 As expected, this latest ZENESIS™ blade offers exceptionally smooth, fast and chip-free cutting on all types of marble. This blade is available in diameters of 12" to 20" and is guaranteed to set the standard of performance and meet the demands of marble fabricators everywhere. 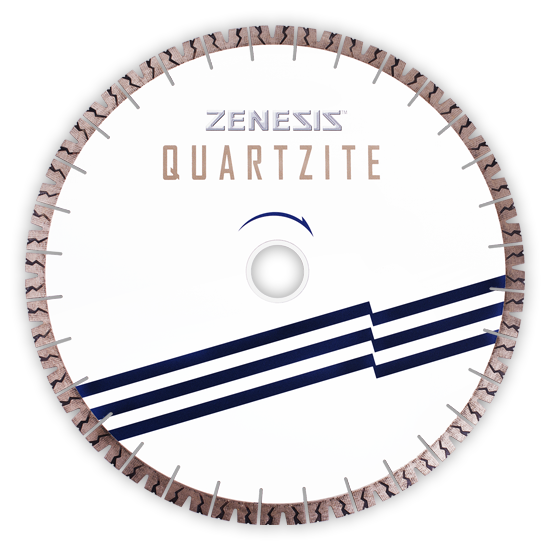 The ZENESIS™ II bridge saw blade revolutionized the stone fabricating industry by raising the bar for cutting speed and blade life. Straight and efficient cutting increases productivity while reducing stress on the bridge saw. 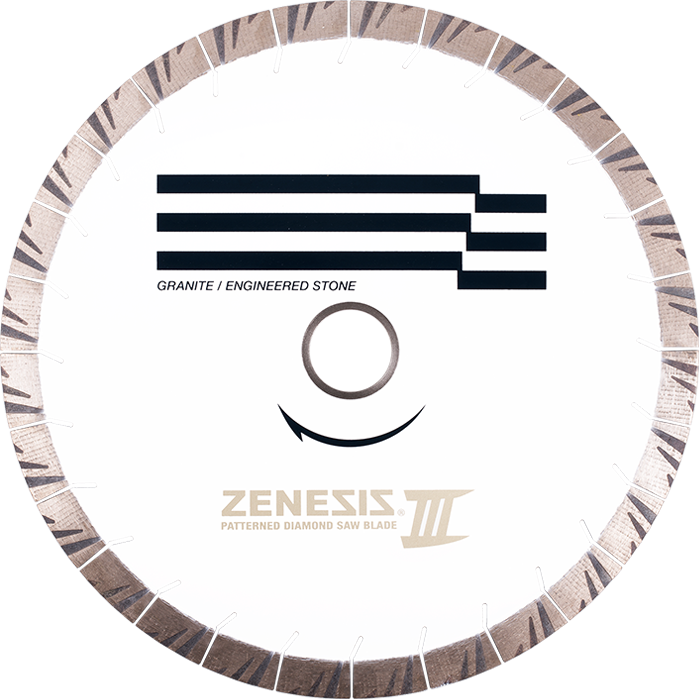 ZENESIS™ announces the third generation wet/dry granite turbo blades. 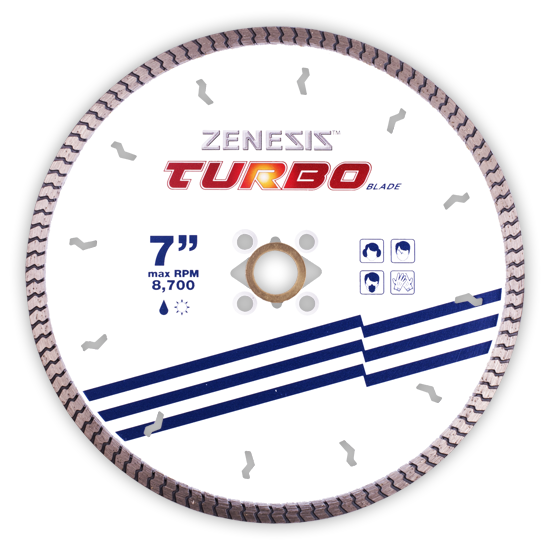 Advancing on the technology that has made ZENESIS™ the best performing bridge saw blades, the new ZENESIS™ Turbo blades outperform all other blades on the market. The unique turbo design provides fast and clean cuts that are virtually chip free, reducing the clean-up time and therefore not only saving you time when cutting but also afterward. Quad holes for flush cut adapters. The new ZENESIS™ Glass Tile Blades provide chip-free performance significantly beyond anything currently available on the market. Independent testing has shown this blade to provide superior performance on all types and thicknesses of glass. Also provides smooth clean cuts on hard porcelain. 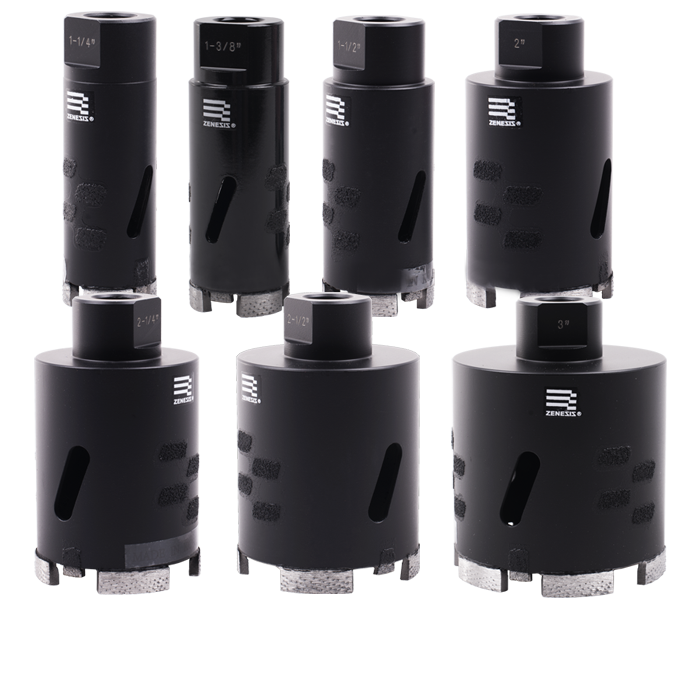 7.5mm segment height for long life. 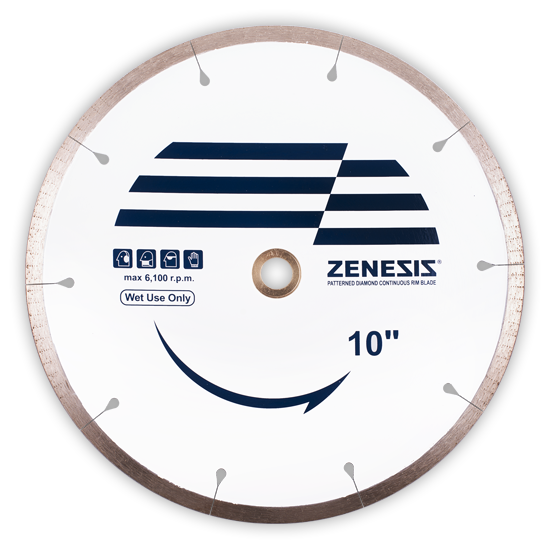 ZENESIS™ Porcelain Tile Blade is designed for professionals looking for fast, smooth and chip free cuts on ceramic and all types of porcelain, including large porcelain sheets and porcelain pavers. The continuous rim minimizes chipping and reduces the risk of blade flexing and segment loss. 10mm segment height for long life. Unique slot and rim design give the ZENESIS™ Continuous Rim Blade unparalleled and effortless cutting precision and performance. Since the blade incorporates ZENESIS™ pattern technology, fabricators can count on exceptionally smooth and chip-free cutting of porcelain tile, granite and other hard materials. Use 4", 4.5", 5" and 6" wet or dry. All other sizes must be used wet. Our 3rd generation ZENESIS™ Dry Core Bit is thoroughly engineered to achieve superior wet and dry coring of granite and engineered stone. Laser-welded segments, enlarged cooling holes, and generous side coating result in faster cleaner cuts without even breaking a sweat. The new ZENESIS™ Dry Core Bit is manufactured with our most advanced pattern diamond technology to date, and is designed to outperform and outlast its competition. 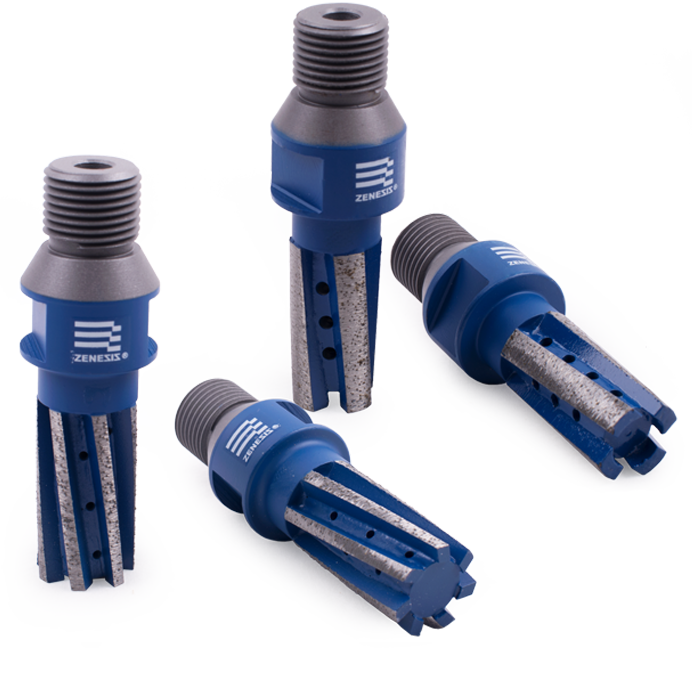 The all-new ZENESIS™ 4 and 7 segment finger bits provide top CNC performance on all stone materials. They deliver precise, quiet and chip-free cutting at faster speeds and can be used on soft to medium-hard materials (4 segments) or medium to hard materials (7 segments). The enhanced design utilizes our most advanced diamond pattern to date, which increases durability and prevents premature wear so that the finger bits will last even longer. 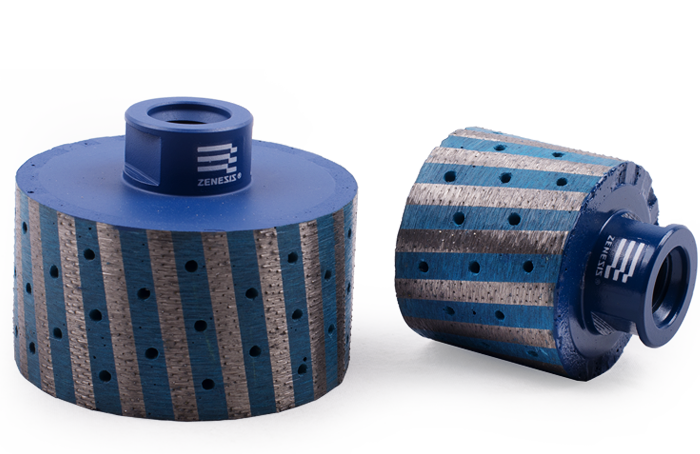 The ZENESIS™ Zero Tolerance Wheels feature resin-filled metal segments for fast grinding with reduced vibration. Since they use ZENESIS™ pattern technology, the tool life is long and the finish exceptionally smooth. Grinding granite and engineered stone. 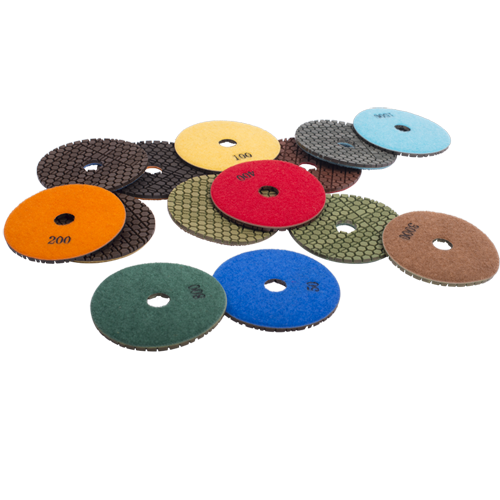 ZENESIS™ introduces an unmatched premium 7-step wet polishing pad. Independent testing has shown these new pads to achieve the highest gloss readings after the 3000 grit level when polishing both white and black granite. Our unique design provides these pads with an exceptional lifespan.